…It certainly isn’t because Libya is involved in the “occupation” of Iraq. Al Qaeda threatened the Libyan government this week in a video released on an Al Qaeda website. The terror group also blamed the US and the UK for Libyan children with AIDS. Laura Mansfield says this is an atypical Al Qaeda video… Yeah, it is. A rather atypical video message from Al Qaeda was announced today by As Sahab, the video production wing of the global terror group. The 17 minute 7 second video features Abu Yahya al Libi discussing the plight of Libyan children infected with the HIV virus. Five Bulgarian nurses and one Palestinian physician have been accused, found guilty, and sentenced to death on charge that they deliberately infecting nearly 400 Libyan children with the HIV virus in 1998. Al Libi, AK-47 at his side, implies that the AIDS incident is an attack by “Crusader Infidels” against Muslim children, and seems to vacillate between heaping blame for the incident on the US, the UK, and the Libyan regime. The video includes English subtitles, which indicate this was directed at an English speaking audience – either US or UK. There are specific references to both the US and UK within the message. 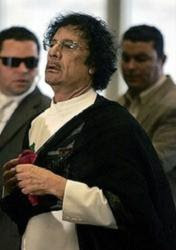 Al Libi’s animosity towards Qadaffi is not surprising since Al Libi “The Libyan” is originally from Libya. In all of the 2006 messages by Bin Laden and Zawahiri, only one (Letter to the Palestinians by Zawahiri in June 2006) included mention of Libya at all.